A big challenge in the VR world is getting haptic feedback no matter where you are. That’s not so much of a problem when you’re sitting in a chair, the hardware can be attached to the chair or to something near you, what’s referred to as grounded force-feedback. But with VR, we’ve gotten used to at least moving around a room. How then do you feel the recoil of a gun, the pressure against a shield, the inertia of a sword slicing through the air, or the pulsations of magic sword emitting lightning? 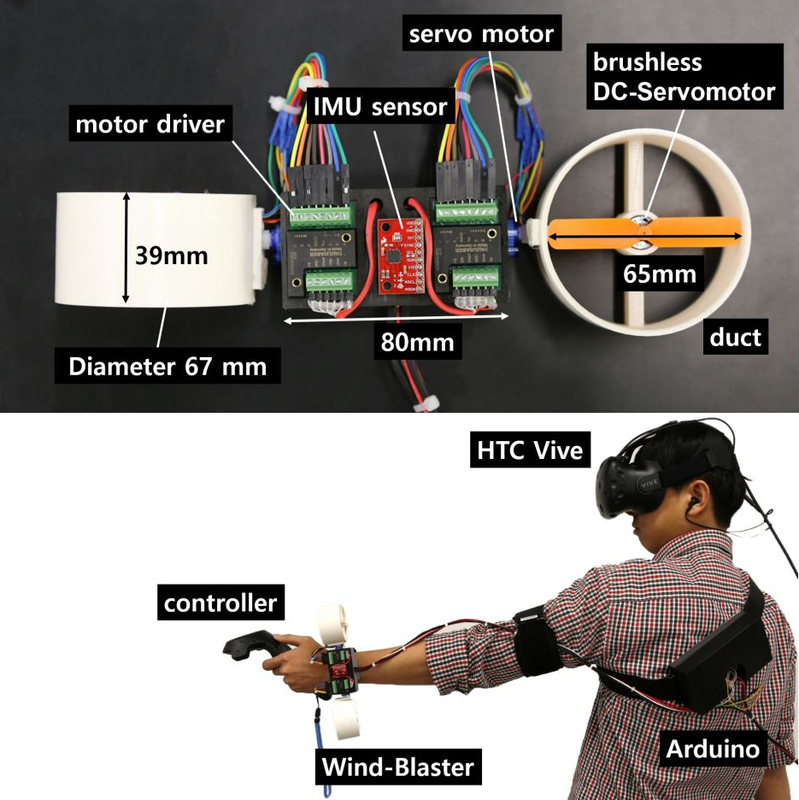 A team of researchers at the [MAKinteract Lab] at KAIST, a university in South Korea, have come up with a small device which straps to your wrist and provides all those types of feedback. It’s called the Wind-Blaster and consists of two ducted propellers which can provide up to 1.5N of force. Both propellers are mounted on servos, and with the help of an IMU, the propellers are oriented as needed. An Arduino doing PWM controls the motor speeds. Fire a VR shotgun and the propellers quickly spin up to 33,000 RPM for just 250 ms, giving your lower arm a quick backward tug, providing the feel of a recoiling gun. Swing a VR sword through the air and the propellers rotate at 33,000 RPM for 400 ms and then linearly decelerate to a stop in 300 ms. Making the propellers move asynchronously with respect to each other causes rotation torque on your arm for a pulsating feeling for the magic lightning-emitting sword. A connected PC runs the games using the Unity game engine. As with drones, there is noise at around 41 dB but the user’s headphones block it out. Watch it in action in the videos below. Here on Hackaday, we’ve covered few more ungrounded haptic feedback systems. There’s one which responds to light, another which lets you feel textures, and a glove which gets feedback as it controls a robotic gripper. Interesting. I would think the inertial kick of the motor suddenly starting/stopping would be a distracting factor. The two fans could be made to spin in opposite directions so that their torques would cancel each other out. I would have thought that a method to achieve this results in a silent way would be to use TENS pads directly on the muscles, and a variable intensity charge depending on the feedback required. I’m not convinced at all of the propeller approach. It is not so easy to make a reliable (long-term) electrical connection to the body. Usually stick on electrodes are used, but they quickly degrade. Neat. What about impedance matching of the target tissue(s) using a wireless method for TENS and a certain signal to create the DC effect? Have to determine best frequency that is safe for the tissue targeted including transmission through the other tissues. how about compress air cartage/cartages that can be “recharged” while not playing or more silent pumps. Variable pitch props would be more instantaneous response. And more controllable force acceleration and deceleration, as well as combining torsion with linear accell/decel. And I don’t imagine wielding anything with my fore arm, so wouldn’t it be better to mount it on the controller itself?